There are several key reasons to visit Kamakura Fushikian, with the first and most obvious one being that it's tucked away in a light, bright and calm warehouse-style food market in Akihabara, which means respite from the chaos outside. 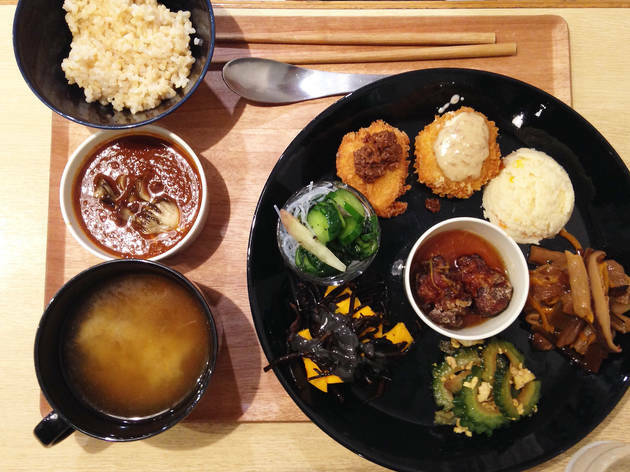 As you walk into the market, you'll find this vegan restaurant in a corner to your right (reason number two: it's vegan – not easy to find in Akihabara). Before taking up a seat at one of the small wooden tables, step up to the counter and choose between two set meals (¥980 and ¥1,530) listed in English. 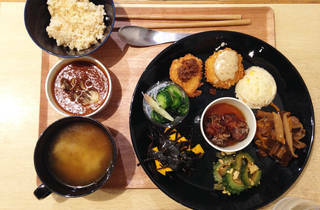 Aside from size, the two meals are basically the same, both offering small portions of the different dishes available on the day, which are on display at the counter, along with rice and miso soup. Reason number three: the white rice can be 'upgraded' to brown rice for ¥150 and you can get a free top up of miso soup and rice if you're still hungry (but you probably won't be, the meal is very filling). Reason number four: the food you'll be eating is called shojin-ryori, which is the cuisine traditionally eaten by Buddhist monks and eschews meat, onion, garlic and other root vegetables. It's very unusual to be able to find this kind of food other than at temples and the quality on offer here is superb. They also have vegetarian 'sweets', and when we asked what kind of tea they had, we were very surprised to hear they serve rooibos, a caffeine-free tea from South Africa. The easiest way to find Kamakura Fushikian is to take the Electric City exit (Yamanote line) from the station and look for the UDX building. Walk towards this building next to the train tracks and you'll pass AKB48 and Gundam cafés. Spot the white signboard that says 'Chabara', the name of the food market, and you've arrived.